In a constant environment, the system which is adapted better has attained a higher evolutionary level. It has more information from the environment at its disposal, it can utilize a larger field of the state space, and adapts faster to common environmental changes. At higher evolutionary levels, more and more system functions are also subject to higher-level evolutionary processes. The autonomy of system functions increases. The environmental models are improving more and more. 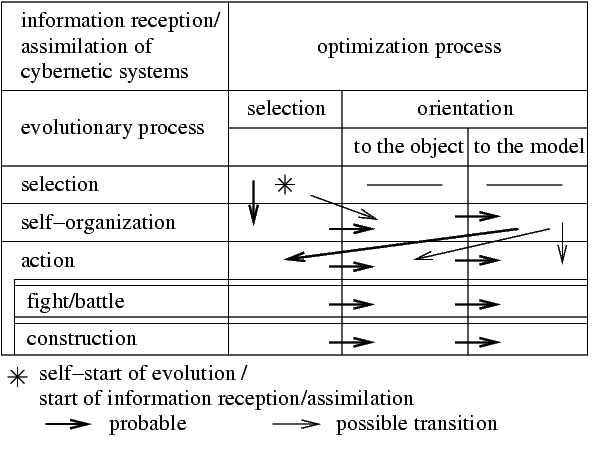 Via abstraction, integration of system functions, and the control structure, they result in a theory of the environment, an image of the criterion. In this case, fight/battle and construction are to be viewed as special forms of action.